A team from Singapore’s Nanyang Technological University (NTU Singapore) has made a breakthrough in “swarm printing”, whereby more than one robot prints a structure at once, thereby greatly increasing the size and speed of the work. NTU demonstrated a system in which two robots printed a concrete structure that was 186cm long, 46cm wide, and 13cm thick. It took the robots only eight minutes to build the smallish object, which then took two days to harden. The research was published in civil engineering journal Automation in Construction. 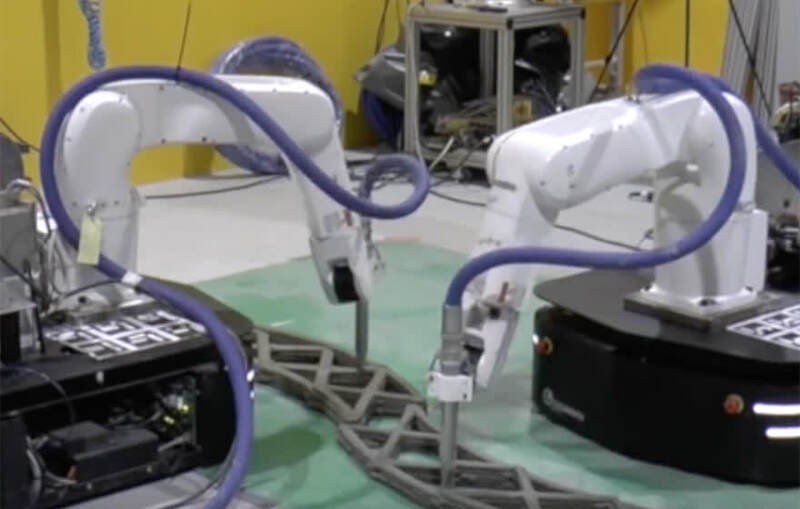 Chua Chee Kai, the executive director of the Singapore Centre for 3D Printing, added: “This multiple robot printing project is highly interdisciplinary, requiring roboticists to work with materials scientists to make printable concrete. We also had to combine their expertise with mechanical and civil engineering experts. At present, printing large structures requires units that are larger than the printed objects, which restricts the size of what can be printed. In the future, the NTU team hopes to improve the robots’ algorithms, and adapt the concrete mixture so it will solidify faster.